December 21, 2015 / LBD "Nytetrayn"
The following was originally posted by JGonzo on Capcom Unity in May 2010, and with the re-releases of the Mega Man Zero games on the Wii U Virtual Console, have been reposted here with permission for posterity. This week, our guest writers wrap up their Mega Man Zero recollections with their final posts about Mega Man Zero 4. Today we have Heat Man from The Mega Man Network remembering his first playthrough of the final entry in the Mega Man Zero series. After Mega Man Zero 3 had come out, the Zero series was really starting to feel like business as usual. Both Mega Man Battle Network 5 and Mega Man X8 were on their way. We started to speculate how long the series would run, if it would ever move to the DS, what kind of mythology the series would pick up in its next installments. If the other series running at the time were any indication, Zero still had a long life ahead of him. After all, the guy never dies. Compared to the previous three Zero games, Mega Man Zero 4 brought about some rather interesting changes. In my opinion, the most notable of these was the addition of an Easy Mode. That's right, Mega Man 10 wasn't the first Inti Creates developed game with that crutch. While I'm not against Mega Man games having Easy Modes, I will admit that Zero 4's might have been overkill (or, "underkill" I guess). You started immediately with nine lives, enemies did way less damage, spikes merely hurt you, and bottomless pits would spit you back out. In other words, you really had to try to die in this mode. The other major change was with the introduction of the Z Knuckle. Rather than present yet another kind of Rod weapon, the Z Knuckle let Zero yank the weapons off other minor enemies, a rather original feature. Now the number of weapons Zero could wield transformed a great degree, but admittedly it was a little gimmicky. Like any game that gives you too many tools to accomplish the same task, it's fun to try out the different weapons at first, but eventually you just stick to the old standbys. But I will give the game credit for letting you take weapons from not just enemies, but also other stage objects as well, which added for some more surprises. My favorite has to be grabbing the lamps in Lunaedge's stage, which lets you push the weak Cyber Elves around later on. Additional developments included a weather change system, which added or took away different effects from the eight main stages. This could also make stages easier to play through, or you could play them harder and assure yourself of winning the boss's EX skill. The Cyber Elf system also got revamped, and now you had one main elf whose abilities you could pick and nurture. No more innocent Cyber Elf murder! Of course, the funny thing about that is a Zero 4 was never really intended to be made in the first place, and Inti Creates had envisioned the series wrapping up after Zero 3. Zero 4 ended up being made for the fans who felt the series still had some loose strings and wanted to see more. Zero 4's story is a pretty good one. After long last, we get to see... what are those things? Oh, humans. You know, the creatures that have been the linchpin of the centuries of Reploid fighting. Before Zero 4, the only two humans we ever had were Dr. Cain and Ciel. But we never really got to see how the war took its toll on the general population, and what the humans struggling to survive were like. We also see the return of Dr. Weil, who kind of got left at the wayside at the end of Zero 3, despite being the main villain orchestrating everything. I think the clash between Zero and Dr. Weil, and the things they stand for, really sums up what this series has been about. I also like how much the game referenced Mega Man X. Right at the beginning we're reminded of the original Maverick Wars. The story also hinges around the crash of the space colony Eurasia, which happened back in Mega Man X5. But for me, the coolest thing was all the huge bosses that were modeled after bosses from the X series games, like the giant Carnage Force 0 being based on Mega Man X2's CF-0. Stuff like that in Mega Man games always creates a strong feeling of cohesion. The one thing I didn't end up caring much for was Craft. We've all heard of antiheroes, and it can be argued Zero himself is one, but if there is such a thing as an "antivillain", that would be Craft. He consistently makes awful decisions throughout the game in his attempts to do right, and he just comes off as kind of a doofy and clueless character. As much as he wants to help and protect, he only ends up hurting many people. Oh well, at least his battle music was pretty cool. Speaking of music! Zero 4 is great when it comes to music. The soundtrack is very hard rock centric, which I must profess I love. Though the tunes are not quite as memorable as some of those from Zero 3, another great soundtrack, I love the thematic style; it's what an action game like Zero should be. To this day I cannot decide whether I like Zero 3's or Zero 4's soundtrack the best. Just listen for yourself above. I like how "Esperanto," the theme for the lush Area Zero stage, is a recurring melody throughout the game. And then the song "Ragnarok," which plays for the final stage and last encounter with Dr. Weil; it really overflows with drama and tension. I don't know if another song from any other Mega Man game has conceived such a deep feeling of evil and hatred. 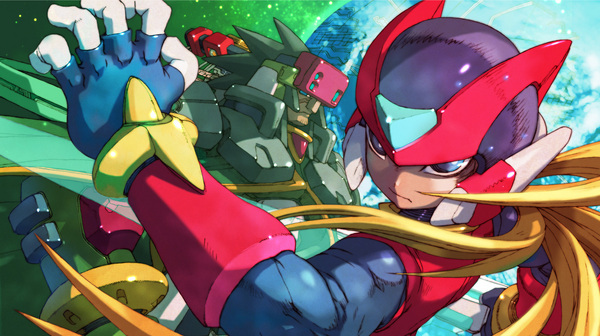 But the most defining thing about Mega Man Zero 4, to me anyway, is that it ended the series. This was absolutely unprecedented in all of Mega Man at the time. Sure, some series have kind of dropped off, but they never had a definitive end. And the way it ended, well, it was kind of hard to swallow at the time. After all, we'd seen Zero pull that stunt before, but he was always back again. It was like seeing the same magic show over again, but this time the magician pulls the sawed coffin apart, becomes sickly looking, and there's an uncomfortable silence all across the crowd. You know, I'd said before that Mega Man Zero 4 is a game that was never intended to be made, but looking back it's hard to imagine it not being made. It wrapped everything up pretty nicely in a great, climactic finale (well, except for what happened to the Guardians, that could have been better explained). And the game also served as a springboard to the ZX series, which was based primarily on the events that occurred in Zero 4. Ahh, just to mention ZX feels a little nostalgic too. Maybe we'll be doing a recollection on that someday! Like I said in my Zero 2 recollection, I never got into the Zero series a great deal. It was more of a holdover as non-platforming Mega Man was taking center stage. But now I feel that perhaps I never gave the series it due. When the Mega Man Zero Collection was first announced, I was in Utah for a friend's wedding. I remember hearing the announcement and thinking "Well, that's cool I guess," and then continued reading over Mega Man 10 info. But as time went on, I was truly surprised by the amount of fan enthusiasm for the Collection. It makes me think that maybe there's something to those games I didn't grasp the first time around. With the amount of people backing the series, it's not just some Mega-Man-in-name-only type game -- it's the real deal. Now that the Collection is drawing near, I'm really looking forward to revisiting the world of Zero!